Learn how to find time for improvement and how to share information across the organization from one of the leading health systems in the world. Running a 4400 bed health system is complex. Hear about the every day challenges with providing the best care to patients. 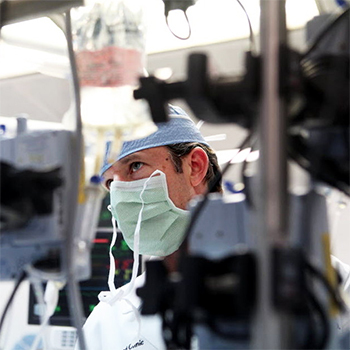 Learn how, by engaging its caregivers in tiered huddles, Cleveland Clinic can quickly and effectively respond with containment strategies and recurrence prevention. Every day from the front line to the CEO, it identifies the issues that get in the way of providing safe, high quality care. Those issues are addressed at the level closet to being able to resolve the problem. Discover how this process engages both nurses and physicians in creating an environment of people who embrace and solve problems. How do you decide what to escalate? How do share information across the health system? How do you find time for improvement? All of this and more will be discussed with examples from one of the leading health systems in the world. Cleveland Clinic, located in Cleveland, Ohio, is a nonprofit, multi-specialty academic medical center that integrates clinical and hospital care with research and education. With more than 1,400 beds on its main campus and 4,435 beds system-wide, it is one of the largest and most respected hospitals in the country. 2017 patient care statistics: 7.14 million total visits; 220,059 acute admissions and observations; 207,610 surgical cases; 3,584 physicians and scientists; 11,862 nurses; 51,487 employees; 18 full-service family health centers;10 regional hospitals; $8.0B operating revenue. Its mission is to provide better care of the sick, investigation into their problems, and further education of those who serve. Nate Hurle is senior director of continuous improvement at Cleveland Clinic. He has spent the last 11 years leading a team that has progressed from individual accolades to system-wide enthusiasm for CI. He has over 20 years of process improvement experience, beginning his career at Eastman Kodak, leading improvement efforts across the organization. His work took him around the world including an assignment at a plant in Xiamen, China. During his time with Kodak, he learned lean concepts and tools from Shingijitsu Consulting Group, a group of former Toyota executives who are masters in lean thinking. Hurle has a BS in industrial engineering from the Rochester Institute of Technology.